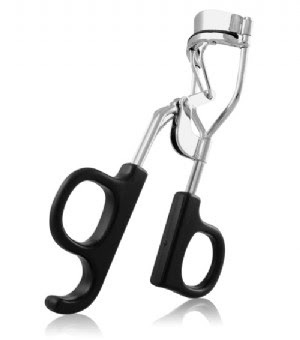 The ELF eyelash curler (shown above) is my all time favorite eyelash curler! And it's only $1!! You can find it on the ELF website, or at your Dollar General store... or wherever else ELF is sold where you live! I have 3 eyelash curlers... one sits on my makeup desk, another in my purse, and another in the makeup bag I take to work. For the ultimate curve... hold the lash curler in place for a few seconds, then reposition the curler slightly closer to the ends of the lashes so you don't end up with one solid crimp- repeat one or two times. It's not absolutely necessary if you have super short lashes. A lot of people say you shouldn't curl your lashes after applying mascara. I must admit- though my primary curl comes from what I do prior to mascara application- every now and then throughout the day- for a little lift- I'll give my lashes a quick curl. Just be gentle and you shouldn't have a problem with pulling out lashes. Don't curl your lashes in a moving vehicle! It's just not worth it if you hit a bump! Don't curl your lashes around a curious cat! My cat likes to watch my mom put her makeup on, and one day he batted at her hand while she was curling her lashes... she lost a few! I've yet to find a "lash curling" mascara that replaces the effect of an actual eyelash curler! Some will enhance the effect, but I've tried nothing that can duplicate it. Some suggest heating your lash curler with a blow dryer... or even using a heated lash curler. I've actually never tried either of these methods, but I'm not against the concept. Just be careful! If you've never curled your lashes, I challenge you to try it out! It helps the eyes look more wide awake, framed, and feminine! Many people have lashes that are so straight they practically point downward- Use a lash curler to give your face an instant "awakened" look! What's up everyone! How are things going? Life has been busy for me lately- hence the lack of blogs. It seems something has been going on every weekend, and I haven't had a ton of quality time with my computer. Oh well! I tend to have these phases where work/social life/family stuff keeps me busy and then it dies down a bit. You may have noticed this on my Twitter or Facebook... but Tyler passed the bar exam! What a load off! It took so long to get the results in, but now he can breathe a much deserved sigh of relief! This should make his job search a lot easier, thank goodness! Let's see what else... I'm getting sort of obsessed with Jawbreakers. I love the sweet-but-not-overly-sweet flavor. In other random news- I've been a loyal viewer of yet another season of "Dancing with the Stars!" I've watched for so many seasons, I'm practically more familiar and more of a fan of the pro dancers than the actual celebrities! I remember several of them from my other favorite dancing show- "So You Think You Can Dance". Do you have any favorites on DWTS yet? I'm enjoying Chelsie & Louie Vito, Dimitry & Mya, Lacey & Mark... and the list goes on! I miss Julianne Hough this season though- she was one of my favorites! Also-- I think the makeup on DWTS is FANTASTIC. Wouldn't it be fun to be part of that process? They all get to look fun & dramatic, sometimes colorful, sometimes following a theme... and it just always turns out great! Perhaps I'll devote a whole blog post to this topic if there are enough other DWTS fans out there! Hope you have a great day everyone! Thanks for stopping by! Oh! I always curl my lashes! It really opens up my eye and gives me that extra oomfh! I have yet to try the ELF eyelash curler! I hope I can find it in stores as I don't usually order online. Currenly I'm using the Revlon one with the white strip. I'm using a Revlon lash curler... and it works okay. Sometimes it is hard to curl the ones one the outside for me. DWTS - :D! I only saw the first ep but I'm rooting for Melissa Joan Hart - b/c she was awesome as Sabrina the Witch :) One of my favorite childhood shows! I recently started curling my eyelashes and I must say, it does make a huge difference especially if you have thin, light eyelashes like me. I never used to do it because it didn't seem to work when I tried, but maybe it's just because I wasn't using a quality curler? I have to curl my lashes - I guess I'm lucky in some ways because they're really long but because I wear glasses so I have to curl them to make sure they don't brush against the glass. Most annoying if I happen to be in a rush! do you know why some people like the shu uemura or sephora or some other fancy expensive curler? is there something different? or is it the brand/price?